What’s an audio file converter? This is simply a file converter that is used to convert one type of an audio file, for instance (WAV, MP3, WMA among others) into another type of audio file. It occurs that you may want to play or edit a certain audio file but end up running into a roadblock because the format is not supported by the software you’re using, this can be frustrating. However, all you need is one of these free audio converter for Mac programs to be able to convert any file format to the format compatible with your software or device. 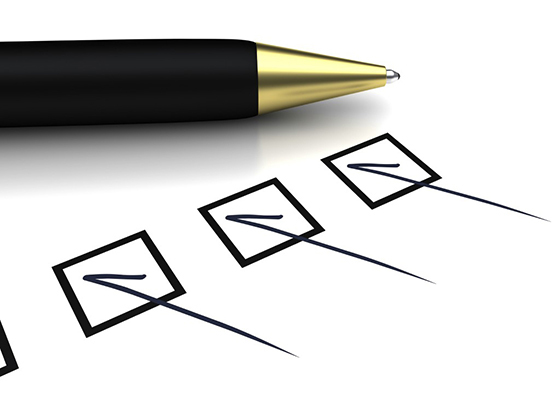 What are the important attributes of an Audio Converter Software? Conversion Speed: If you need to convert just a few files then speed may not be that important. However, if you have lots of files to convert then a fast converter software will save you a great deal of time. The slow conversion speed is a setback when using a converter software. Import and Export Formats: A good audio converter should be able to import all available audio formats and convert them to the needed formats. Extraction Capabilities: A good free audio converter for Mac software should not only be to convert and compress a file but also be able to extract audio from streaming services, video files as well as CDs. That said, now let’s look at the top 5 free audio converters for Mac. Let’s face it! There are so many audio file converter options on the market and selecting the best may be challenging. However, we can confidently state that All2MP3 for Mac is the best free audio converter for Mac. It’s pointless trudging the internet trying to find an audio converter only to be disappointed, download this amazing tool and you’ll be surprised by not only its speed but also amazing quality. Select the music you wish to convert, drag it into the program window after which you’ll see a few options in the prompted window. If you’re a newbie and just want to get your music converted for emergent, you can just use the default settings, just choose the folder with the “Change All Paths” button. However, you can adjust the output quality by dragging the slider on the bar of “Quality”. Click the Convert button and All2MP3 for Mac will convert the music to MP3 right away. 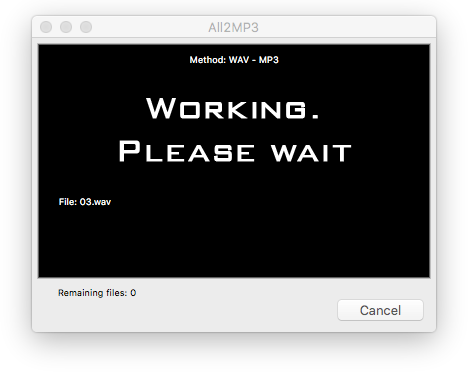 What are the advantages of using All2MP3 for Mac? 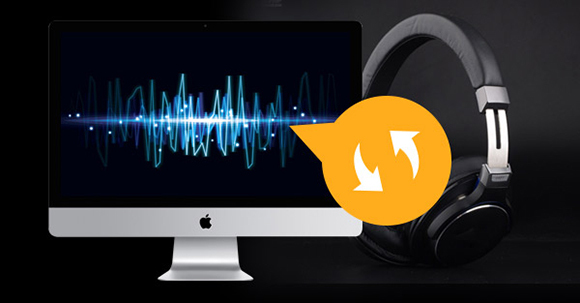 This is the quickest free audio converter for Mac program. The Switch takes approximately 40 seconds to compress the 625 MB WAV file, and this duration is 23 seconds shorter as compared to other programs. The conversion speed sometimes is not significant when you want to convert just a few files. However, when you need to convert a large file, a converter with high speed is appropriate since it reduces the conversion time. The Switch software has a batch-converter capability, which enables someone to put many files in sequence and allow to convert the files without supervision. The Switch software is applicable for Mac computers & Windows and is well-suited with 40 audio formats which can be converted into outputs of 26 output. Moreover, despite the fact that Switch software converts large audio files to smaller formats to save space, it can also extract an audio file from DVD & other video formats such as MOV, MPEG, and AVI. In addition, Switch’s feature enables the user to record audio from streaming services such as Pandora & Spotify. For instance, the Audio Stream Wizard converts a radio playlist to MP3 that the user can upload in the phone & listen to the music without network connectivity. Some of the customers have experienced that the Switch software stops converting the files after a duration of 14 days. This is something that I have not experienced but it is important to note that observation. In case of such a problem, the program should be uninstalled & wait for the program to request for reversion to a free, non-trial version (instead of completely deleting the program). In addition, some customers have also identified that some of the antivirus programs ascertain Switch as malicious software. This is something that I’m yet to experience. However, in case of troubles in using with Switch, then it is recommended that you used a different software from the available list. This free audio converter for Mac service is online based. This software converts the common formats of audio that are not larger than 180 MB. In order to perform the conversion, the user uploads the original audio file, select the anticipated output format, and wait for an email that contains a link to the converted file. The user can upload & delete the audio files using a direct URL and the files that are kept in the Google Drive account. The input formats are: 3GA, AC3, AAC, AIFC, AIF, AMR, AIFF, AU, FLAC, CAF, M4R, M4A, MID, M4P, MMF, MIDI, MP3, MP2, OGA, MPGA, OMA, OGG, QCP, OPUS, RAM, RA, WMA & WAV. 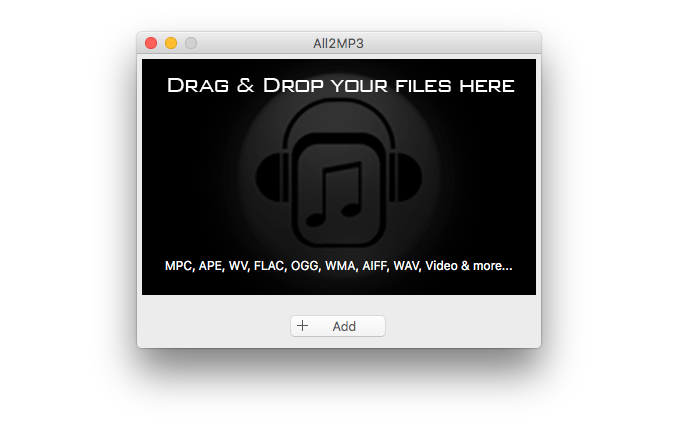 The Output Formats are AC3, AAC, AIFC, AIF, AU, AIFF, M4A, FLAC, MP3, M4R, OPUS, MMF, RA, OGG, WMA and WAV. The main issue with FileZigZag is that it takes a lot of time to upload the file and obtain the link via an email. Though, many audio files come in a small size even large tracks of music. The FileZigZag software is compatible with the OSs that provide support to a web browser, such as Windows, macOS, & Linux. This software is a good free audio converter for Mac since it is reliable than other online file converters. However, it is not robust as an enthusiastic file converter software. Additionally, FileZigZag is simple to utilize, supports several file formats, and is quick as compared to other online file converters. This software is appropriate for those users who like skipping the download-and-install procedure since the file conversion is done online. Free conversions of the file. Easy to use hence, can be used by even first time users. Converts several of files of various formats. This program has the capability of converting the files of various formats such as image, audio and TXT. Supports large size files, greater than 180 MB, unlike other programs which support files of limited size. For instance, Zamzar only supports files that do not exceed 500 MBs in size. Takes a lot of time to convert the files. This is because the conversion speed of this software is slow. Thus, it takes a lot of time to upload, convert and download the output. It converts several documents of various formats such as image, video, audio, & archive. The conversion of the file is done in three steps & the download links are effective for three days. The user can utilize the Advanced Converter to upload files to FileZigZag from PC, Google Drive account, or a URL. FileZigZag is an outstanding online file converter and it is faster than other free audio converter for Mac. Despite the fact that there is other software that is similar to this one, FileZigZag has proved to be faster as compared to other available programs. It is not easy to use FileZigZag. The user needs to visit the website & upload the file to be converted, select the format that the file should be converted to, & then press the Convert button. The email from FileZigZag will be sent with a link to the converted file. This software is appropriate for the users who want a document converter & an image converter. However, FileZigZag is not my top priority since t takes a lot of time to upload & convert a file. Thus, the other software should be tried. This is a free audio converter for Mac program that is very easy to use and it functions without confusing interfaces and advanced options. 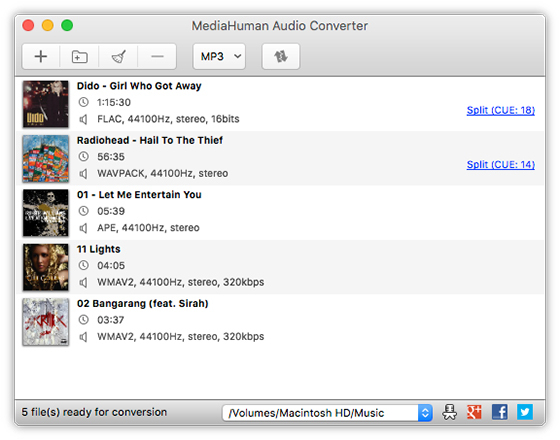 To use MediaHuman Audio Converter, simply drag & drop the audio files to be converted into the program, select an output format, & then begin the conversion. The input formats are AC3, AAC, AIFF, AIF, AMR, ALAW, AU, APE, DSF, CAF, FLAC, DTS, M4B, M4A, MP2, M4R, MPC, MP3, OPUS, OGG, SHN, RA, WAV, TTA, WV, and WMA. The Output Formats are AC3, AAC, ALAC, AIFF, M4R, FLAC, OGG, MP3, WMA, and WAV. Batch conversion- Add the files to be converted, choose the output format & then press Start. The program converts the files automatically. Lossless formats support- The user can convert a lossless format to another, minus intermediate conversion. For instance, FLAC can be converted to Apple Lossless, which is supported by many Apple devices. Automatic splitting of CUE – The software detects the CUE files & advocates the division of the image into individual tracks. Search for disk covers- The software retrieves the covers using the web services for a file that has ID3 tags without the cover art. iTunes support- The program adds the converted file directly to iTunes multimedia library. The user can select a particular playlist. Retain of folder structure- The user can command the software to retain the folder’s structure when performing a conversion. 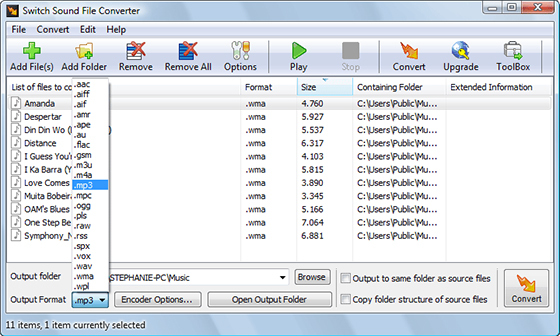 Therefore, the MediaHuman Audio Converter is appropriate for users who need advanced options since this program enables the customization of items such as the default output folder. The user can add the converted music to iTunes automatically & search cover art form. However, these options are normally hidden. The supported OSs are Windows 8, Windows 10, Windows Vista, Windows 7, Windows Server 2003, Windows XP, and macOS 10.5. The file is upload from the computer or a URL entered to an online file to be converted. The Input Formats are AAC, 3GA, AIFC, AC3, AMR, AIFF, CAF, APE, M4A, FLAC, M4R, M4P, MP3, MIDI, OGG, OGA, RAM, RA, WMA, and WAV. The Output Formats are AC3, AAC, M4A, FLAC, MP3, M4R, OGG, MP4, WMA, and WAV. This program is simple to use. The user simply visits the website, uploads the original file, selects the output format & then clicks the Convert button. The user then waits for an email to be sent that contains a link to the converted file. The email attachment conversions is another feature that is supported by Zamzar. With the file(s) attached, the user can send the text to the email which matches the required format to be converted in the syntax @zamzar.com. For instance, to convert a PNG file to JPG, the user is required to send the PNG file to jpg@zamzar.com. However, if the user wants the DOCX file to be converted to PDF format, then he/she should send it to pdf@zamzar.com. Also, this program supports various file formats such as WPD, RA, FLV, & DOCX and it makes working with these formats easier and hence it is reliable. Moreover, Zamzar is the best option for the users that need a free audio converter for Mac or an image converter. However, the 50 MB limit size makes it inappropriate for use as a video. Large files take longer to upload, convert & download. Finally, this program also has an optional premium tier services such as Pro, Basic, and Business with increasing file size, the speed of conversion, online storage space. The major challenge with Zamzar is a 50 MB limit for the file size. Although several audio files fit in this size, some formats can be large than this limit. Also, Zamzar’s conversion is slower than other online free audio converter for Mac programs and this prolongs the duration taken to convert the files from one format to another. However, Zamzar can be utilized with several modern web browsers on any operating system. It can be supported on Mac, Linux, and Windows. In addition, this program is a better free file converter and it supports many formats of the file. It is easy to use this software and it enables the conversion of files online without actually downloading it. This program can be the best option for the users who have been disappointed by the other programs that they have tried. It can actually provide a good solution to them. Zamzar like any other file converter has some merits and demerits. However, the use of this program should not be avoided due to the few setbacks since there is no system or program that is 100% efficient. Easy to use hence, can be convenient to even the first time users. A small size limit of 50 MB makes this program inconvenient for audio & video conversions. This is the main challenge in sung this program. Delays in conversion when there is high traffic on the website. This is because high traffic overloads the website making the speed of conversion to be slow. The downloaded links are just valid for one day. This implies that the users will not be able to use the links after 24 hours have passed unless they subscribe to a payment plan. It can only support a maximum of five files per session. This makes it inconvenient when there is need to convert many files simultaneously. Waiting for an email in order to download the converted file causes delays. It is supported by any OS because it only needs a browser to operate (Zamzar operates on Linux, Windows, Mac, etc.). The user can upload from the computer or by entering a URL to an online file. In addition, this software converts several documents that are in the video, image, audio, archive, & CAD formats. It also converts TXT files to the MP3 format and file conversion occurs in four steps without any download needed. This program can also be utilized to convert files that do not exceed 1 MB via email. Finally, non-email conversion of files up to 50 MB up upgrading to a payment plan is required to enables the conversion of files larger than 50 MBs.